Perfex Adjustable Salt Mill grinds all types of coarse salt easily and effectively. 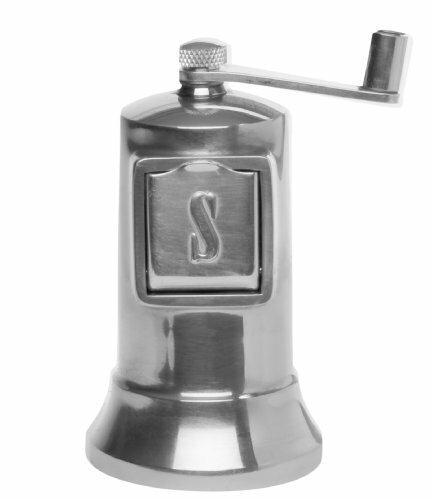 Made in Saint-Etienne, France since 1946 from long-lasting heavyweight aluminum with a corrosion-resistant stainless steel grinding mechanism, Perfex Salt Mill offers strength and durability along with a simple elegance that complements any style. It won’t corrode or rust like metal grinders can when used for grinding salt. The burr-style grinding mechanism easily adjusts from fine to coarse by simply turning the locking nut located on the underside. The front-loading chute makes refills faster and easier. From Himalayan pink salt, kosher salts, Celtic sea salt, fluer de sel, kala manak, flake salt, red and black Hawaiian salt, smoked salt, pickling salt, and more, Perfex is ready for any cooking task and dining occasion, either indoors and outdoor entertaining. So easy to use. Simply open the front-loading chute, fill with desired salt, close the chute and turn the crank-style handle for a smooth and comfortable grinding action. Made from heavyweight aluminum with a corrosion-resistant stainless steel grinding mechanism, Perfex Salt Mill is strong, durable, will never dull or oxidize. Wipes clean with a dry cloth. Built to last a lifetime. If you have any questions about this product by Perfex, contact us by completing and submitting the form below. If you are looking for a specif part number, please include it with your message.